High School Musical Onstage, extended! Due to the apparent success of STAGES and Trumpets Playshop's staging of Disney's High School Musical (HSM), producer and director Audie Gemora, teen heartthrob and lead star Sam Concepcion, and the whole cast and staff of the production are very happy to announce that their show is extended until July 22, still at the Meralco Theater. HSM has been performed to sell-out crowds, and has been reaping critical success, as well. Also seen enjoying the show are celebrities like Martin Nievera, Richard and Lucy Gomez, Rowell Santiago, Iya Villania, Karylle, Jamie Rivera, Reymond Sajor, Raki Vega, Bituin Escalante, Gino Padilla, Dra. Vicki Belo, Tim Tayag, and staunch supporters of the arts, former President Fidel Ramos and wife Mrs. Ming Ramos, among others. 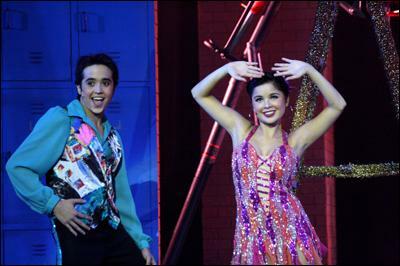 "Sam Concepcion (who plays male lead Troy Bolton) has proven that he really has what it takes to be a star," comments senior entertainment columnist Ethel Ramos after watching the show. "He really stood out in the staging." Concert King Martin Nievera adds, "I was blessed and inspired both as an artist and as a member of the screaming audience. HSM educated my curiosity of what talent, dedication and dreams will be like for the superstars of tomorrow. HSM is a must see. Awesome!" Showbiz icon Richard Gomez also quips, "the members of the cast were fantastic," while his wife Lucy Torres admits that she immensely enjoyed the show. The couple watched the show with daughter Juliana. Aside from Sam, Cheska Ortega (Gabriella Montez), Alex Godinez (Sharpay Evans), PJ Valerio (Ryan Evans), Kakki Teodoro (Taylor McKessie), Seve Ching (Chad Danforth), and 40 other cast members also dish-out impressive performances. Veteran actors Sheila Francisco and Jeff Arcilla provide "sensational" support to the teens as they play Drama Club Moderator Mrs. Darbus and Coach Bolton, respectively. Memorable spots in the show include "When There Was Me and You," "I Can't Take My Eyes Off You," dance spots "We're All In This Together," "Getcha Head In The Game," "Breaking Free," "Start of Something New," among others. This stage adaptation also boasts of having, to quote lifestyle columnist Toff De Venecia, "one of the most brilliantly executed curtain calls I've seen to date." 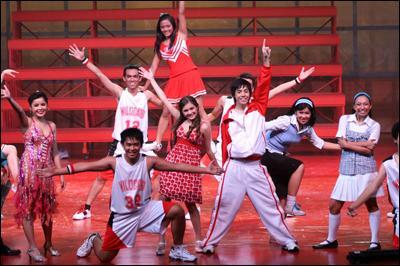 Catch the last two weekends of High School Musical Onstage at the Meralco Theater. Showdates are as follows: July 14 (3 p.m., 8 p.m.), July 15 (3 p.m.), July 21 (3 p.m., 8 p.m.), and July 22 (3 p.m.). For tickets, call Ticketworld 891-9999 or STAGES 818-1111 loc. 209 or 225. I'm looking for High School Musical.